At Promotion Pros, we believe in giving you tons of options for outfitting your company with brand-specific products, which is why our custom individually wrapped food items are so awesome. Take a look at our range of personalized food products that are individually wrapped and choose the one that best suits your business needs. Our supply includes the ever-popular gourmet cookie and brownie assortment gift box with a wonderful variety of home-style chewy treats. Looking for a sweet way to show your gratitude? You've found the ultimate reward with a Gourmet Cookie & Brownie Assortment. 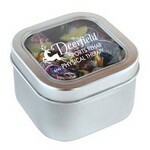 This Striped Spear Mints in Large Square Window Tin includes cool mints in a reusable tin box. 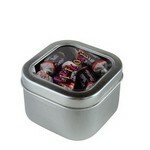 The Tootsie Rolls in Small Square Window Tin are chewy candies in a reusable container.